Sea otter biologist and researcher Benjamin Weitzman will provide an in-depth look at sea otters along the Pacific coast in a public lecture at the Seymour Center at 1 p.m. on Sunday, February 20. Weitzman's talk, "More Than Just A Furry Face," is part of the Science Sunday lecture series at the Seymour Center at Long Marine Laboratory. The event is free with paid admission or membership. 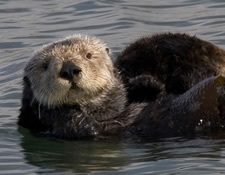 Sea otters have a unique life history that makes them an important part of the near-shore environment. Weitzman will discuss how current research is being used to further our understanding of sea otters, their environment, and the conservation of one of our shoreline's most charismatic marine mammals. Weitzman has been working with sea otter researchers from the U.S. Geological Survey, California Department of Fish and Game, Monterey Bay Aquarium, and UC Santa Cruz since 2007, primarily as field biologist assisting with sea otter observations, population counts, mortality studies, and dive-based captures. He is currently pursuing a graduate degree at UCSC and works as a graduate student researcher with the U.S. Geological Survey on projects in Big Sur, Monterey, and Alaska. His thesis work examines the effects of sea otter recolonization on soft-bottomed communities in Glacier Bay, Alaska. Located in Santa Cruz on the bluffs overlooking Monterey Bay, the Seymour Center provides exciting and engaging ocean education programs for the visiting public and for students of all ages. It is dedicated to educating youth, families, and the general public about the role science plays in the understanding and conservation of the world's oceans. The Seymour Center is open six days a week, year-round, and serves more than 60,000 people each year.